Between 1976 and 1992, scores of workers, progressive labour activists and citizens, and communities rose to oppose what progressive economists Barry Bluestone and Bennett Harrison called ‘the deindustrialization of America.’ Coalitions of workers, union organizers, religious and civil rights leaders, and progressive activists resisted plant shutdowns in cities across the country such as Cleveland, Youngstown, Pittsburgh, Detroit, Chicago, and Los Angeles. Economic crisis, corporate restructuring, the globalization of production, plant closure, debates around industrial policy, and the inability of organized labour to address capital investment through collective bargaining created the opportunity for resistance. These conditions also presented an opportunity where progressive labour-community coalitions challenged managerial prerogatives on the grounds that they were entitled to sharing private property rights. Similar to movements for industrial democracy that emerged in response to the instability of corporate capitalism during the late-nineteenth century and during the Great Depression, campaigns to stop plant shutdowns during the 1970s and 1980s were ultimately movements for economic democracy. Workers and activists sought ways to hold corporations accountable for their decisions and to expand economic decision making. What distinguished earlier struggles from those during the 1970s and 1980s was that the call to democratize decision-making extended beyond factory workers. For activists such as the Ohio Public Interest Campaign’s (OPIC) Ira Arlook and Edward Kelly, plant closure was a “public” issue, not just a matter of collective bargaining. Demands for economic democracy during the 1970s and 1980s underscores the limits of the post-World War II collective bargaining regime in the U.S.—enshrined in the 1950 UAW-GM contract, or “Treaty of Detroit”—that designated plant location, capital investment, and control over technological development as managerial prerogatives. While deindustrialization began long before the 1970s, the process intensified as scores of factories closed during that decade. The spate of plant closures during the 1970s and 1980s resulted in the loss of thousands of manufacturing jobs. Youngstown lost nearly 10,000 jobs due to steel mill closings between 1977 and 1979. Cleveland lost 68,442 manufacturing jobs between 1979 and 1983. California lost a little over 8,000 jobs between 1980 and 1983. Capital flight and joblessness, or as labour activist-intellectual Staughton Lynd claimed, ‘economic hardship’, provoked workers to protest and opened up the possibility for challenging corporations’ management rights and the articulation of economic democracy, or community-worker rights to industrial property. Campaigns to stop plant closings in the state of Ohio and cities such as Los Angeles relied upon building coalitions of workers, labour unions, civil rights and religious groups, and the larger communities where particular plants were located. The campaigns, however, devised different strategies and tactics and sought different goals. Former anti-war activists founded the progressive organization, OPIC, in fall 1975 to build a statewide coalition of professional activists, labour unions, civil rights, religious, and senior citizens groups, and elected officials. Their goal was to pass the Community Readjustment Act (CRA), a law that would discourage plant closure in Ohio. Between 1977 and 1983, Youngstown steel workers, along with labour intellectual Staughton Lynd, engaged in direct actions with the hope of eventually buying back Campbell Works and U.S. Steel. In 1982, Eric Mann and other workers in Van Nuys General Motors (GM) plant in Los Angeles organized laid-off workers and labourers to stop GM from closing the plant. They combined interracial coalition-building with the threat of a boycott to keep the factory open for another ten years. While the impetus for challenging managerial private property rights grew from the grassroots, these campaigns often relied upon labour activist-intellectuals to develop analyses of deindustrialization and frame the issue in terms of labour and community rights to industrial property, or economic democracy. Many of the labour intellectuals came out of the New Left. Lynd, who assisted Youngstown steelworkers’ efforts, was a civil rights and peace activist. Eric Mann worked for the Congress of Racial Equality and the Students for a Democratic Society prior to his participation in the labour movement. OPIC’s Edward Kelly and Ira Arlook worked for Ohio’s chapter of the Indochina Peace Campaign (IPC), which organized a national campaign to stop U.S. military involvement in Vietnam, Laos, and Cambodia. The cadre of labour activist-intellectuals were not limited to these men as the Detroit Alliance for a Rational Economy’s (DARE) Kenneth Cockrel, Jack Russell, and Dan Luria, Labor Notes founder Kim Moody, and former UAW activist and current Labor Notes writer Jane Slaughter also provided vital analyses of deindustrialization and framed struggles around plant closure during the 1970s and 1980s. EXTERIOR OF ENGINE ROOM. Republic Iron & Steel Company, Youngstown Works, Blooming Mill & Blooming Mill Engines, North of Poland Avenue, Youngstown, Mahoning County, OH. 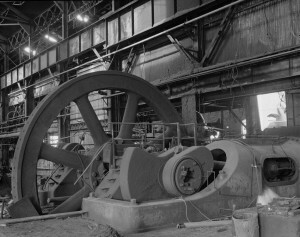 (1988) Courtesy of Library of Congress Prints and Photographs Division Washington, D.C.
OPIC produced one of the most comprehensive analyses of deindustrialization for progressives fighting plant closure during the 1970s and 1980s. In 1977, OPIC’s Edward Kelly published Industrial Exodus: Public Strategies for Control of Corporate Relocation. Kelly maintained plant closings did not occur as the result of natural market forces. Instead, they were the ‘direct result of conscious decisions by large corporations to pursue their own private gains without regard to the overall public cost.' According to Kelly, firms moved south and overseas in search of cheap and non-unionized labour. The document featured a comprehensive plan to address the industrial exodus. Kelly called for the adoption of a federal plant closing law modeled after the CRA that required two year advance notice of relocation, assistance to workers, and withholding tax benefits for firms who moved without acceptable justification. Industrial Exodus also called for the creation of public financial institutions like state and local public banks, state insurance companies, and state development corporations. These institutions would provide capital to support already-existing small businesses, cooperatives, and workers and communities that sought to takeover abandoned industrial plants. However, Industrial Exodus failed to explain how workers would govern their own plants. Although labour-community coalitions to stop plant closure enjoyed marginal success intellectually and politically, many of the campaigns ended with workers unable to achieve their desired result, whether it was the passage of legislation or the retention of factories. Ohio’s business community, especially the Ohio Manufacturers Association, successfully lobbied against OPIC’s bill where it died in the state legislature. U.S. President Jimmy Carter’s Economic Development Administration refused to provide capital to Youngstown steelworkers to buy and reopen the U.S. Steel plant. Courts declined to force U.S. Steel to offer its plant for sale. These circumstances empowered U.S. Steel in its refusal to negotiate with workers for a buyout. The Van Nuys UAW local successfully kept GM from closing the plant for a decade. However, GM ultimately shutdown the plant in 1992. Studying campaigns to stop plant closure during the 1970s and 1980s may provoke scholars to complicate narratives of organized labour’s decline after World War II. It may be worth viewing the years of 1974 and 1981 as crucial points contributing to the decline of union density rather than just endpoints of the labour movement. Workers and labour organizers in Los Angeles, Youngstown, Chicago, and Detroit helped organize collective responses to deindustrialization in the decade after President Ronald Reagan fired striking Professional Air Traffic Controllers Organization (PATCO) workers in 1981. These campaigns highlight how economic crisis created opportunities for workers to make more radical demands on industrial capitalists. Clearly, the call for greater democracy in industrial decision making is not new. The concept of democratizing economic decision making during the 1970s draws from a long tradition of progressive politics extending back to fights for industrial democracy during the late-nineteenth century and through the 1940s. The history of industrial capitalism in the U.S. is one of recurring crisis, transformations in political economy, and the reconstitution of corporate power, but it also a story of workers’ and activists’ intellectual, legal, and political challenges to the status quo. 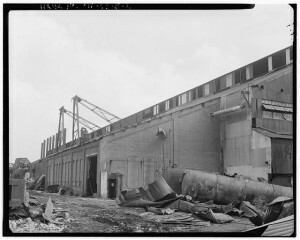 B. Harrison and B. Bluestone, The Deindustrialization of America: Plant Closings, Community Abandonment and the Dismantling of Basic Industry (New York, 1982). S. Lynd, Living Inside Our Hope: A Steadfast Radical’s Thoughts on Rebuilding the Movement (Ithaca, 1997), 160; E. Hill, ‘The Cleveland Economy: A Case Study of Economic Restructuring’ in W.D. Keating, N. Krumholz, and D.C. Perry (eds), Cleveland: A Metropolitan Reader (Kent, Ohio, 1995), 55; R. Baker, ‘LA’s Booming Industry Now a Memory,’ Los Angeles Times (1991). E. Mann, ‘Keeping GM Van Nuys Open’, Labor Research Review, 1, 9 (1986), 36. E. Kelly, Industrial Exodus: Public Strategies for Control of Corporate Relocation (Washington, D.C., 1977), 26.